An new promotional video for the Galaxy S4 was released by Samsung in the form of a musical short film named Hi Hey Hello. The company tries to promote some of the new features of their flagship device such as Dual Shot, Smart Pause, Drama Shot, Sound &Shot and Air Gesture by smartly making the guy in the video attract the attention of the girl that he likes. While the video is fun to watch, for us something else catches the attention. 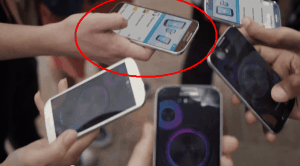 You can closely look at min 1:08 and you will see a brown version of the Galaxy S4. We currently know about the White Forst, Black Mist and Blue Arctic versions. 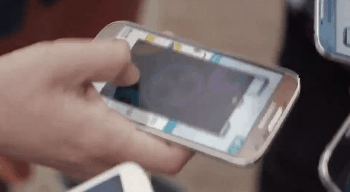 This version of the device actually looks really nice, and I personally like the idea of a Brown S4. Samsung’s flagship runs on a Quad Core 1.9 GHz CPU and 2GB of RAM and carries a 13 MP camera and Full HD Super Amoled display screen.